Jaren Jackson Jr., or “Triple J” as Marc likes to call him, is a PF/C prospect who has worked his way up NBA Draft Boards over the past couple months and is now projected to be a top 5 selection. Jackson put together some impressive numbers in his one season at Michigan State, including finishing 2nd in the NCAA in Box Plus/Minus (15.4). 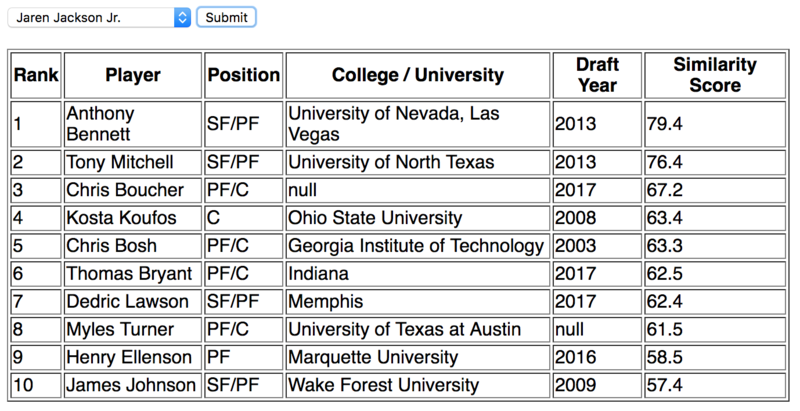 Two initial benefits to Jackson’s NBA projections are his age (18.6 years old – among the youngest in the draft) and his high school recruiting rank (#9 RSCI). He has made significant strides in the last year, theoretically adding to his upside, as he appears to be somewhat of a late bloomer. Jackson is also the son of former NBA player Jaren Jackson Sr. – maybe dad has taught him a thing or two about what to expect from NBA life. Safe to say there is a lot to like about Jackson’s NBA potential. PNSP is a scaled aggregate of box score statistics, allowing us to determine how prospects project in different statistical categories. Jackson projects above average in most statistical categories, with no concerning lows and some promising highs. In particular, he has interesting projections as a scorer in the NBA. Jackson projects off the charts on 3-point shooting for a big man, which isn’t a surprise considering he shot 40% from 3 and 80% on free throws at Michigan State, including an insane 26/58 (44.8%) on NBA 3s, which ranked in the 92nd percentile among NCAA bigs (per Will Shreefer). Jackson’s outside shooting should allow him to space the floor well in the NBA, and, further, he has flashed the ability to drive to the basket when his outside shot is contested. 82% of his shot attempts were either at the rim or a 3-pointer, a seemingly perfect role for a modern big man. Jackson was also efficient on the inside – his 64% shooting at the rim ranked in the 82nd percentile among NCAA bigs (per Will Shreefer). Overall, he projects well above average as a scorer, doing much more damage from the 3-point line than the average NBA big man. While that list puts him in #ELITE company, his Similarity Scores are a bit more puzzling. The first thing to notice is that his most similar player is just a 79.4 – most other players have a handful of comps in the 98-100 range, if not their entire top 10 list. This isn’t necessarily good or bad but merely means that we have not seen many historical players of Jackson’s archetype. Which isn’t terribly surprising considering his high outside shooting rate for a big man. For example, the 5 bigs in the list above had 20, 8, 5, 0, & 0 three-point attempts in college and Jackson had 96…. If we are to conclude anything from this list (which is debatable), we could say that these players had mixed levels of NBA success and two logical comparisons to Jackson are Myles Turner and Chris Bosh, as athletic big men who are + defenders/rebounders and can shoot 3s. Jackson projects as an above average NBA big on both offense and defense. He fits the ideal profile of a modern NBA big with his ability to shoot 3s, finish at the rim, defend the perimeter, and protect the rim. While he will prove valuable by merely fitting that profile, it remains to be seen exactly what his offensive upside is. At this stage, he does not appear to have the decision making and passing skills necessary to be a difference-making playmaker on the offensive side of the ball. As we mentioned, he is still coming into his own as a basketball player, and thus his playmaking development may be the difference between becoming a Clint Capela / Rudy Gobert compared to a true difference-making offensive big such as Karl-Anthony Towns / Anthony Davis.